The Invasive Species Specialist Group has launched the Invasive Species of the Week to highlight the impacts of invasive species on native biodiversity and vulnerable ecosystems. A different species will be featured each week. I’ve just released a WordPress plugin which creates a widget that you can add to your blog’s sidebar. The widget displays the latest photo in the series and links to a PDF fact sheet. To add this to your blog, click Add New in the Plugins section of your blog’s admin screen and search for Invasive Species. The WordPress Plugin Directory has more info. If you install the plugin, please go there and give it a rating and compatibility feedback. Add a bug to your blog! Bug Of The Day is a WordPress plugin that creates a Bug widget which you can add to your sidebar. 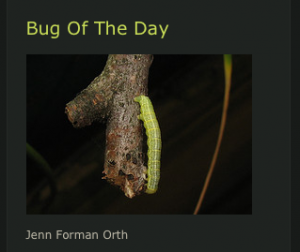 The widget displays the latest photo in Jenn Forman Orth’s Bug Of The Day series. Most photos are from her back yard in Massachusetts, the creepiest back yard in America. To add this to your blog, click Add New in the Plugins section of your blog’s admin screen and search for Bug Of The Day. The WordPress Plugin Directory has more info. If you install the plugin, please go there and give it a rating and compatibility feedback. Brighten up your blog with a happy, happy flower! Wildflowerizer is a plugin that lets you add a sidebar widget to your WordPress blog which randomly displays a photo that’s been recently added to the collaborative field guide: Wildflower Field Guide, North America at Flickr. To add this to your blog, click Add New in the Plugins section of your blog’s admin screen and search for Wildflowerizer. The WordPress Plugin Directory has more info. If you install the plugin, please go there and give it a rating and compatibility feedback.